There are, I think, eighteen DVD versions of Mozart’s Le Nozze di Figaro currently available so there needs to be something very special about a recording for it to stand out. Unfortunately Stephen Medcalf’s 1994 Glyndebourne production doesn’t really despite having a strong looking cast. It’s a pretty traditional looking production with breeches and crinolines and sets which look a bit like a giant doll’s house. 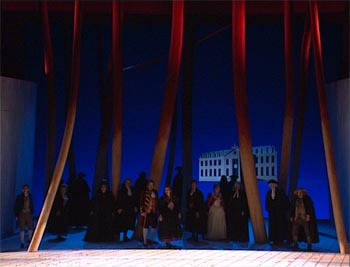 The Personenregie is well thought out and the stage picture often artfully composed. The acting is almost uniformly excellent. It’s a good solid production but with nothing original in the least about it. Musically it has quite a lot going for it too. Alison Hagley sings Susanna with her usual vocal excellence and excellent comic acting skills. Gerald Finley is a very lively Figaro and sings exceptionally well. 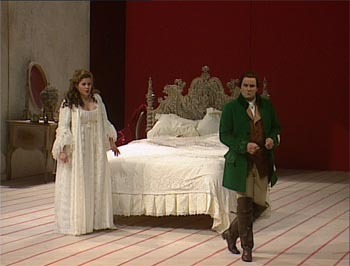 Andreas Schmidt is a bluff Count with a lovely lyrical baritone and some very stylish singing. Unfortunately Renée Fleming is having a bit of an off day as the Countess. She looks and sounds tired and her singing is mannered and neither as elegant or as beautiful of tone as one might expect (was she pregnant at the time?). The Cherubino of Marie-Ange Todorovich is worse. She sings OK but her acting is the weakest of the bunch and she never convinces us that she’s anything other than a singer in drag. The minor roles are mostly pretty good. I especially liked Wendy Hillhouse’s strongly characterised Marcellina though I found Susan Gritton’s Barbarina exceptionally irritating. Bernard Haitink conducts the London Philharmonic and gives a solid, straightforward reading of the score with no concessions to HIP style. The Glndebourne chorus is, as ever, excellent. The DVD doesn’t do anyone any favours. The Dolby 5.1 sound is very thin at the top end which makes the violins and the sopranos sound a bit hollow and squeaky. To make matters worse the singer/orchestra balance, pretty decent for the most part, goes strangely awry for part of Act 3. The Dolby 2.0 track is even worse. The picture is OK DVD 4:3 though it gets faked out by some cruel horizontal lines in Act 1. Derek Bailey is the video director and gives a 1990’s TV picture with lots of close-ups. He’s not too self indulgent except maybe in the last act where some weird camera angles and strange choice of shot make the already confusing plot very hard to follow. There are no extras to speak of and subtitles are limited to English, French and German. The main reason to see this is Finley’s Figaro. There aren’t many recordings (not nearly enough) of Hagley but her Susannah was captured better the previous year in Gardiner’s Paris recording. There are many better recordings of Renée Fleming. This entry was posted in DVD review and tagged bailey, dvd, finley, fleming, glyndebourne, hagley, haitink, hillhouse, lpo, medcalf, mozart, schmidt, todorovich by operaramblings. Bookmark the permalink. On this one I have to disagree with your conclusion although I do agree with most of your comments. Perhaps it’s because I’m just so taken with Alison Hagley. I liked her too in the Paris production but her acting here with Finley was just superb. 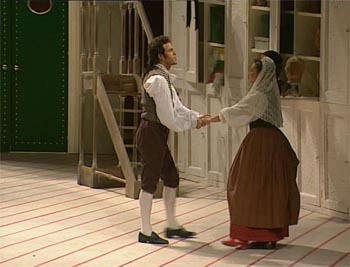 There are many better filmed Figaro’s but I find myself reaching for this one more than any of the others. What a shame that we only have these two and the Pelleas et Melisande. I’ve often wondered why her career ending so suddenly. I wish we had much more of Ms. Hagley too. I tried doing some googling to find out why she apparently, quit singing but to little avail. I agree with John, rather a dull affair, glad I borrowed it from the library rather than buying it. Renée Fleming was indeed pregnant during this production.